A couple of weeks ago, I had an email from a lady by the name of Liz, who was organising a charity event in Roath. Male choirs! A raffle! Raising money for kids in Palestine! Would I put something up on We Are Cardiff? How could I possibly have refused her. So I’ll hand over to Liz to tell you about her event and a little something about her event. I’m a Cardiff born and bred musician who studied music at London University. After a time of doing some non-musical related jobs, I started working for Community Music Wales as tutor and then project manager. It was while working with them that I became curious about how I could connect more deeply with service users and work towards specific therapeutic goals using music. I trained as a music therapist at the RWCMD where the MA Music therapy training used to take place. Being a music therapist means connecting and relating to people largely using co-improvised music created in the moment. You have to be really good at listening and tuning in to what is heard and unheard. It’s a great job, and now we have a new training centre here in Caerleon, where I am the course leader. It’s great to have a training centre in Wales again. 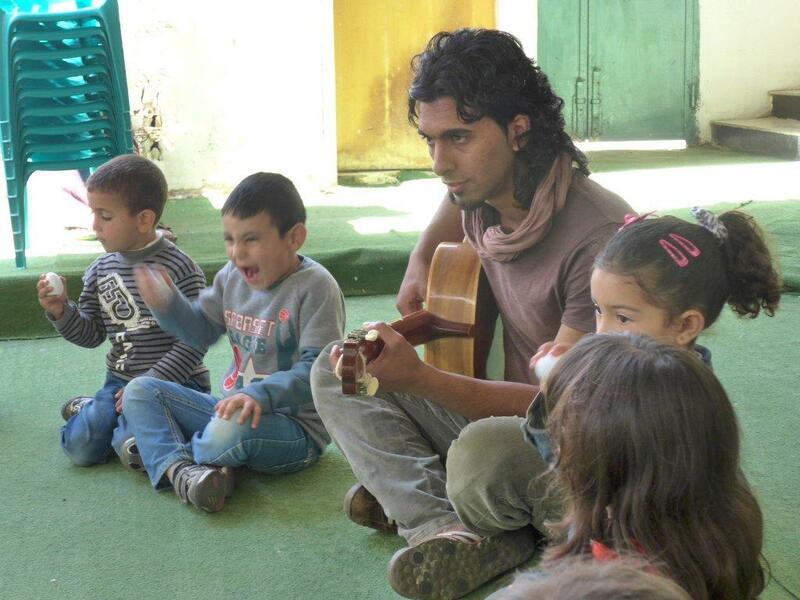 I ended up working in Palestine after I spotted an ad from a charity (www.MusicAsTherapy.org) for a music therapist to lead a six-week music therapy skill-sharing project in Bethlehem with teachers and social workers. That was in 2009, and I have continued to return and support teachers, social workers, nurses and kids to enrich their provision/work towards wellbeing and health related goals ever since. It’s something that I feel very passionate about. Being creative in a country where creativity is stifled as a result of the Occupation is something that I can help with, and I believe it makes a difference. The worst thing that happened in Palestine was having to cancel music as therapy sessions in the Aida Camp due to tear gas being fired in the streets by Israeli soldiers. Seeing the kids terrified, their eyes streaming and absolutely panic-stricken was very painful. We were only trying to give them music lessons. 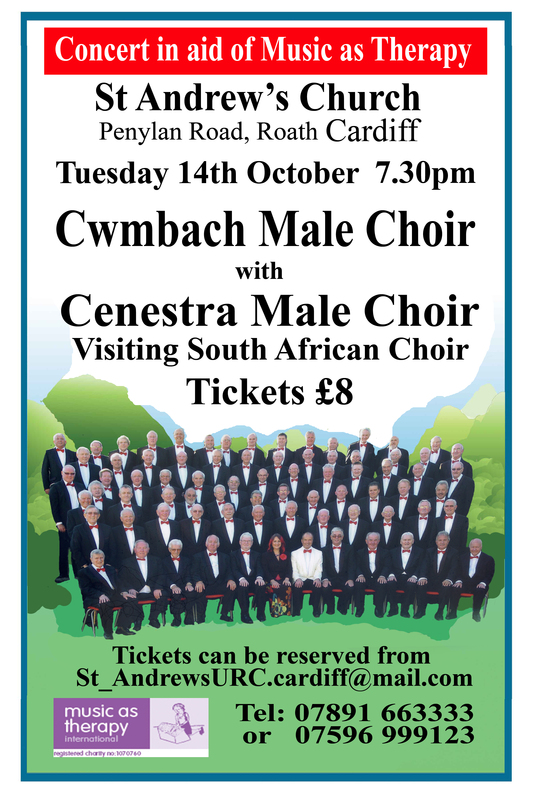 The show will feature Cwmbach Male Voice Choir and guest choir Cenestra from South Africa. Tickets cost £8 and can be purchased on the door, or in advance by calling 07596 999123. There will be a varied programme of traditional and contemporary favourites on offer, including a raffle! All monies raised will go to support music therapy projects in Palestine, including Project Beit Sahour (a project managed Liz Coombes and UK charity http://www.musicastherapy.org). Liz Coombes is a Cardiff based music therapist and course leader of the MA in Music Therapy Course at the University of South Wales. She has been working in the West Bank on projects to support teachers and social workers in engaging children and young people in therapeutic music-making to help them reach their potential and reduce the traumatising effects of the ongoing conflict there. She currently lives in Plasnewydd.